locomente...: Let your Imagination Float! When Mommy dearest got the opportunity to make a kolam (which is rare because I am mostly around), she seized the opportunity. And this kolam is a testimony of why I am what I am. She is a bundle of talent and an inspiration… Ammaji – you rock!!! Your mom is really talented! 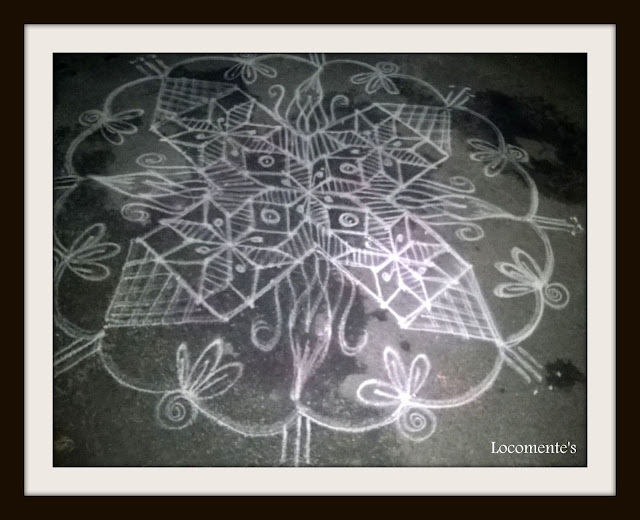 Very rarely people draw kolams nowadays...no space near the doorstep in apartments is the main reason. Pretty neat and lovely done by your mom! I think it's important to provide creative activities for kids. In my apartment, I have seen few kolams painted in front of their doors. I see it not authentic but then I pass it off with a thought, perhaps they have no choice.